Dragonskull Magic has the profile of Diana Enright in the Who's Who archive. Diana Enright resides in the high desert of New Mexico, USA. "I'm also known as Kangaroo Katie, The Pirate Queen, The Pocket Lady, Madame Zola, Morganna the Enchantress, Katie the Balloonatic, and the Ringmaster of KDROO's Amazing Flea Circus. “I spent my childhood at the local library, where I soaked up all I could about the world of magic, circus lore, and side shows. I recall being curious as to why there were so few female magicians, yet I was so happily enthralled with the history and mystery of it all that it simply never occurred to me to become one myself. Needless to say, I grew up and took another path. A job in a hospital emergency room led to clown school. I was completely taken with comedy magic, and soon found myself welcomed into the fold of the local magic scene. Many of those people became my dearest friends and mentors – interestingly, several are well known in the field of bizarre magic. It seems they knew who I really was long before I did! With encouragement to "take off the makeup”, Katie the Pocket Lady was born. I began adding a new character and show every few years, all based on historical research and my own whimsical imagination. I currently have nine characters, and another close to hatching. I was shocked to wake up the other day with the realization that I’ve been doing this for twenty years now! I perform at private parties, libraries, schools, trade shows, fairs, corporate events and restaurants - doing everything from magic and storytelling to juggling and balloon sculpting to face/body painting to palm and tarot reading. It would be fair to say I’ve always been a bit eccentric, so moving into the realm of the bizarre was not difficult. One of my highlights in magic is to have been the first elected woman president of the IBM Ring 90 for NM in 1997. Introducing my flea circus nationally at Weerd Weekend in 1998 was another. Attending Mystery School in 1999 was a pivotal point in my life, both professionally and personally. In 2002 I began working for the New Mexico Endowment for the Humanities as a traveling Chautauqua performer with a one woman show based on the real life and times of medicine show entrepreneur Violet McNeal. Appearing on the cover of Mum in March 2005 has started the year off with a bang to say the least! I will be performing at the ICBM and the Gathering in Scotland in the fall of 05, and trying my hand at lecturing. Some of my most precious treasures are the friendships I have made through magic over the years. The lessons I've learned from my audiences are another priceless gift and resource. Seven years ago, after a divorce and the death of my father, I went back to school and earned a BA in Anthropology. I immediately went on to grad school, where I am still working toward an MA in Communication. After two years of research and interviewing (Thank you all! ), I have come to the conclusion my work will be nothing more than an academic novelty if it doesn’t have some impact in the real world, so I have scrapped the idea and changed course. At the beginning of 2005 I switched from thesis to “project” status” and have begun writing a children’s book aimed at dispelling stereotypes about women in magic. I am actively engaged in ritual magic. In my spare time, I’m settling into a new home, gardening, laughing, and dreaming. You may also find me dancing in the light of the moon, swimming under the stars, or fishing at sunrise. We live in times that are in great need of magic. As performers of magic I believe we are entrusted with a sacred task. Our stories can bring healing, laughter, inspiration, and a sense of connection to people, even if only for a brief moment. We have the power to bring forth the dark side so that it might be examined. We have the power to create or dispel myth. Our magic, both individually and collectively, has the power to create a safe space in which to pose the questions people so often prefer not to ask. We owe it to our audiences to leave them looking deep within themselves for their own answers. Whether we perform to entertain, shock, soothe, or teach, we must consciously give it our most sincere intent. I find my deepest satisfaction in Bizarre Magic for these very reasons. As a both a magician and one who believes in much that is unseen, I walk a fine line, yet not to do so would be dishonorable. People everywhere are searching for something they cannot express, and while we cannot offer the answers, we can, with our magic, encourage them to open their eyes to the infinite possibilities." 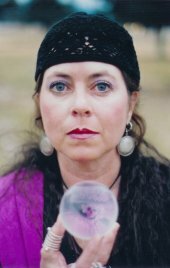 Kate was featured in the March 2005 issue of MUM Magazine (lots of photographs) and she is to be initiated as a member of the Inner Circle of Bizarre Magicians during the ICBM Gathering in November 2005 (details of the event can be viewed in 'EVENTS'). Anyone attending this event is in for a treat in more ways than one when they see and meet up with Kate. Back to the List of E's.